Enzyme (co-enzyme (Q10) preparation. 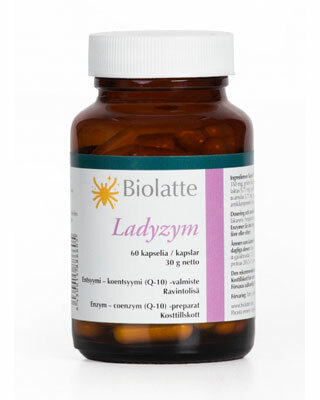 Dietary supplement for all women. Product packaging: 60 capsules, 30 g net. Bulking agent (microcrystalline cellulose), pullulan, lipase, lactase, α-galactosidas, phytase*, α-amylase, protease, co-enzyme (Q-10), anticaking agent (magnesium stearate). α-amylase 571 u*, protease 285,5 u*, co-enzyme (Q-10) 5 mg.